The team list for ARWC 2018-Reunion has 64 names on it. Some are there for the experience, some have won a place as a World Series race winner this year, others are contenders for a top 20, top 10, top 5 or podium place. They’ll have their own team targets and some may even tell me what these are when I speak to them before the race. Others will prefer to keep their own counsel. Any of those with the skill, experience and endurance to finish top 10 will either be thinking about the possibility of winning or trying to put that idea out of their minds! At most world champs there are a few who realistically stand a chance of claiming the title … but this time around there are more than a few. It could be a Dotwatchers’ dream as it promises to be an intense and highly competitive race. But … a new team taking the title will have to dislodge Avaya (NZ), who have won the last 4 world titles in a row racing as Team Seagate. They are rarely beaten in international racing, and have put a very big gap between themselves and any chasers at recent World Champs. (I was going to say ‘shown a clean pair of heels’ … but that’s not very apt for AR.) They have won 5 of the last 6 word titles and even in the year out (2013 in Ecuador) Stu Lynch was on the winning team. They are favourites no doubt of that, but the contenders will wonder if, or when, they will falter, make a big mistake, suffer an injury, or simply slow down a bit! For this race long standing team captain Nathan Fa’avae comes out of retirement to race with the team once again.“We are really looking forward to Reunion,” he said, “as it looks like such a dynamic and vibrant place to explore and visit. The name itself has some meaning to us as I haven’t raced with the guys since Australia 2016 – so that will be fun. He is back racing with Stuart Lynch and Chris Forne again, but injury has forced a fairly late change with Jo Williams breaking her ankle while skiing at the end of September. She is replaced by Fleur Pawsey, who hasn’t raced with the team before but knows them well and has raced with Lynch before. One of the great strengths of Avaya is that they can call on such high class replacements from within the Kiwi racing circuit should they need to. She is one of New Zealand’s top female multisport racers and raced ARWC in Spain, captained a team in Abu Dhabi, and has raced XPD and in China several times. However, she’s not raced internationally since 2010 and came into the race with only 6 weeks notice. “As we are from a flat country (highest point 318m, highest single slope 65m) we can’t expect easy going at the race although the stats of the course are pretty similar to Raid Aran in Pyrenees. Uphill biking will be our biggest challenge compared to the strong teams that live in mountainous countries. There are 5 World Series winners in the line up from this year; Team Columbia (ESP), Swedish Armed Forces Adventure, Tri-Adventure Antelopes (AUS), Blizzard (Russia), and Movistar Terra Aventura (ECU). Of these SAFAT, Columbia and Movistar are all top 10 ranked teams and have the most ARWS experience behind them. That’s 8 potential challengers for the title, but there are more. In the strong Swedish entry are Haglofs Silva, who have more experience than almost any other team and are world ranked #3 (alongside Estonian ACE Adventure). They have also beaten Seagate in an ARWS race (Raid Gallaecia). There is big entry from South Africa too (the closest country to Reunion with an established AR calendar) and the 3 most successful and experienced teams are Merrell Adventure Addicts, Cyanosis and Sanlam Painted Wolf. The latter were in the mix in the final stages at ARWC 2016, Cyanosis have won a World Series race in the past and Merrell have been led the way in South African racing for many years. We are a long way into this article … and I’ve not mentioned the French teams yet, who are technically on ‘home ground’ and are competing at a Raid in France after all. There is a strong entry as you might expect, lead by 400Team Naturex who are world ranked #6. Also in the top 20 rankings are Agde Raid Adventure (11th) and FMR (12th+). Both Naturex and FMR have won ARWS races, and then there are Lozere Team2Raid, who were racing for a podium spot at ARWC Wyoming last and had to withdraw at the last TA. Team captain Nicolas Rambier says; “The team is nearly the same as in ARWC last year in Wyoming, Fanny Frechinet, Maxime Brajon and Nicolas Rambier, except our orienteer Benjamin Monier can’t come, so it’s Rudy Gouy on the map instead. He is the former Quechua team captain, and was World Champion in 2005.
Who else? Uruguay Natural US are the current #1 ranked team in South America, and there is one other kiwi team racing. Team Yealands have won Godzone, and that is not easy to do! And flying the flag of Hong Kong are The North Face Adventure Team. 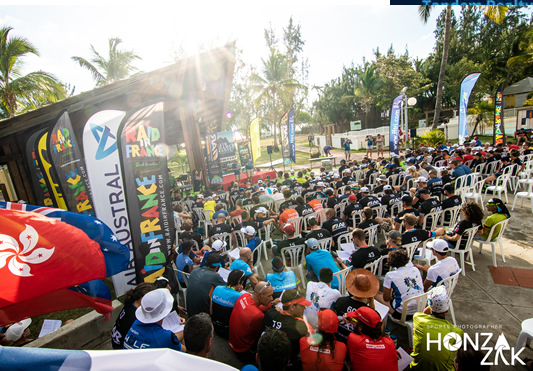 They have been dominant in Asian multisport for many years and for this race have the considerable ARWS experience of Brazilian racers Guilherme Pahl and Camila Nicolau to call on. So, pick you favourites and watch the dots move in the days ahead, its going to be a great race! Live tracking at: http://live.arworldseries.com/arwc18/ will keep you up to date with exactly where teams are during the race. The site also has extensive photos, videos, leaderboard and reports. Become a #dotwatcher !!!! Live Streaming Tune in on https://www.facebook.com/arworldseries for the start at 6am Reunion Time (GMT+4) on 8th November and the winners around the 12th November (disclaimer! it is a remote island in the Indian ocean and internet access could be challenging!) Other live streaming throughout the race so keep checking back. Facebook coverage through https://www.facebook.com/arworldseries and https://www.facebook.com/raidinfranceofficial/ Lend your support and encourage teams on this epic journey. Instagram follow us on instagram https://www.instagram.com/arworldseries/ and https://www.instagram.com/raidinfrance/ Let us know if you love the grit and determination displayed by these world class athletes. News Stories AR World series news stories are released on http://www.arworldseries.com/ and http://www.raidinfrance.com/en/ A Great way to catch up on the overall progress of the race.